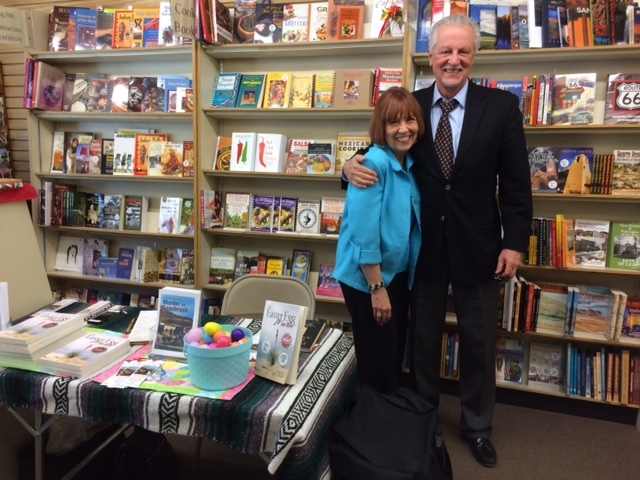 In anticipation of my latest mystery, Murder on Sagebrush Lane, I scheduled a book signing at Treasure House Books & Gifts in Old Town, Albuquerque. For the past three years now I’ve been welcomed at Treasure House to sign copies of my first mystery, The Easter Egg Murder. With that title, and that particular holiday, it’s been a logical pairing. This year the focus was to be on the new book.Imagine my dismay when I discovered Sagebrush Lane would be delayed in shipping due to a couple of glitches along the way. Notice had already appeared in the Albuquerque Journal announcing the debut and signing of the new book. It was too late to rectify that, so now what? Well, the amazing John Hoffsis, owner and proprietor of Treasure House Books, just happened to have an available opening the Sunday after Easter, and he offered me the opportunity to do both days: Easter Egg on Easter Sunday, and Sagebrush Lane on the following Sunday. I readily agreed, of course. Now the story becomes populated with more incredible people.